Back at the beginning of fall, this couple brought me in to create some formal photos and capture images during their wedding ceremony. Their wedding was, in essence, a ‘backyard wedding’, though the property belonged to a family friend. And this wasn’t just any backyard, this was a private lighthouse turned fully realized home right on the Chesapeake Bay! Needless to say, it was an amazing place for a wedding and this couple did a beautiful job with it! We began the day with a first look, then captured a few photos with the couple. This couple had opted not to have a wedding party, so we spent all of this time together, just the three of us. 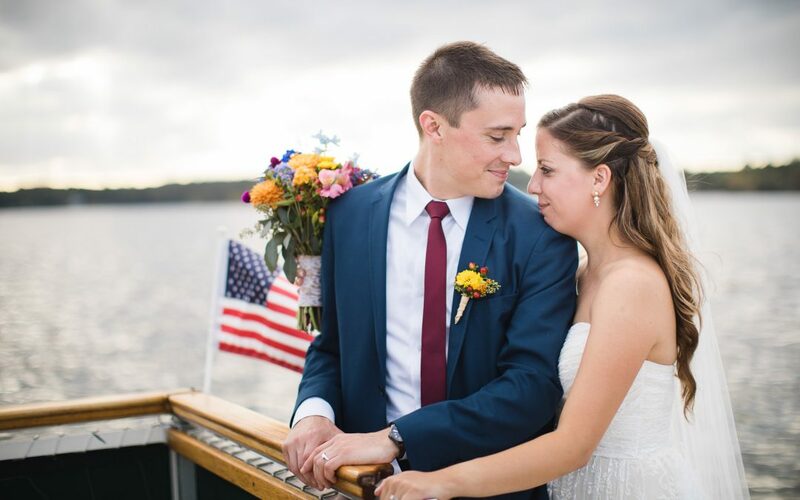 After their ceremony, which was windy but beautifully officiated by the bride’s uncle, we stepped onto a boat for a quick round of portraits from the water, with the lighthouse in the background. Everything about the shooting experience was amazing, and although I didn’t get to see the reception, the closeness I sensed among this family makes me think it was probably beautiful. I think the photos speak for themselves. Something new we introduced last year, and this couple took advantage of, was a new type of wedding package designed to help balance the desire for striking photography and high level professionalism, with the realities of many couple’s budgetary constraints and changing values toward wedding planning. A wedding day shouldn’t leave you broke, after all! So we call them ‘Ceremony & Formals Only’ packages, and the idea focuses our attention only those images which are likely to be the most important to you in the very long run. The result is key wedding images created by a highly experienced, high level professional, while skipping the luxury expenses of a full day of coverage. These new packages have proven quite popular so far among all kinds of different wedding clients! If you’re having difficulty finding someone you trust, whose work you like, and that you can afford—or maybe spending $5,000 on photos all day just doesn’t fit into your value system—consider whether it might make sense for you to focus just on images from your ceremony and formals. Check out the wedding photography page here on our website for more details about our services and packages!